I live in a two-story condo and need to reach a spot on the wall high above my staircase to do some handy work. A ladder is the only way I can do this (I am stating this explicitly in order to avoid responses of Well, tell us exactly what you are doing so we can possibly find an alternative). A scaffold for a staircase would be nice, but there's no place around here that rents them out for a reasonable price. 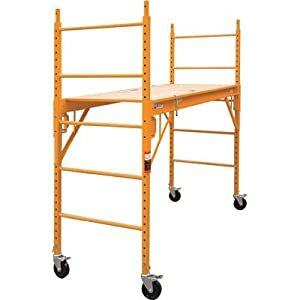 I came across an idea on YouTube to set a ladder up against a wall and then lay a board across the staircase and one of the rungs on the ladder, but there's no way I can transport a board of such length in my sedan. As I am sorta forced to find a way to do this on my own, I came upon the dangerous idea of creating a platform by stacking a few cinder blocks on a lower step and putting a sheet of plywood across the blocks and a higher step. I have a rail that will serve as backing for the plywood. Conceptually, it seems like a sound idea, but I am coming to you guys for alternatives that might help me avoid breaking a part of my body. Update: Since I am in dire need of a super quick solution and couldn't find a PiViT per Tester's recommendation, I picked up a Werner 22' multi-use ladder from Lowe's. Tester gets the mark for best answer since his answer addresses my question. Even though I haven't tried it, I know it would work. 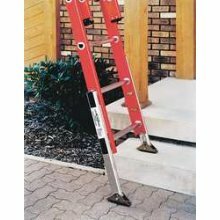 If you're using an extension ladder, they sell Ladder leveling feet. I also stumbled across this product The PiViT Ladder tool, though you'd need two for a step ladder. We've released a new tool to address this need. 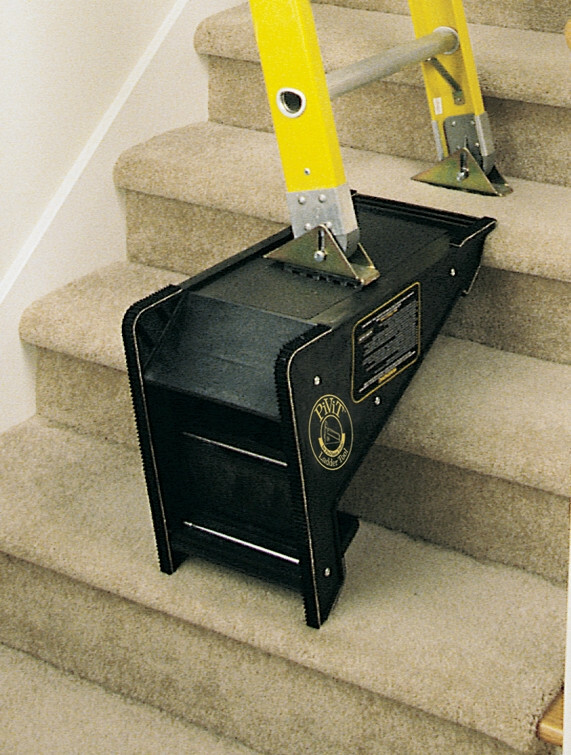 It's a small, compact platform for using ladders on stairs, with adjustable height to fit any staircase. I hope this helps someone down the road. You can find it online (www.ladder-aide.com), or in paint and home improvement stores. This can easily be accomplished with a bakers scaffold (you can buy/rent). They're totally adjustable. I'm in construction for twenty years now and really, there's no better way to go. Are spindles strong enough on a balcony to keep a toddler safe?